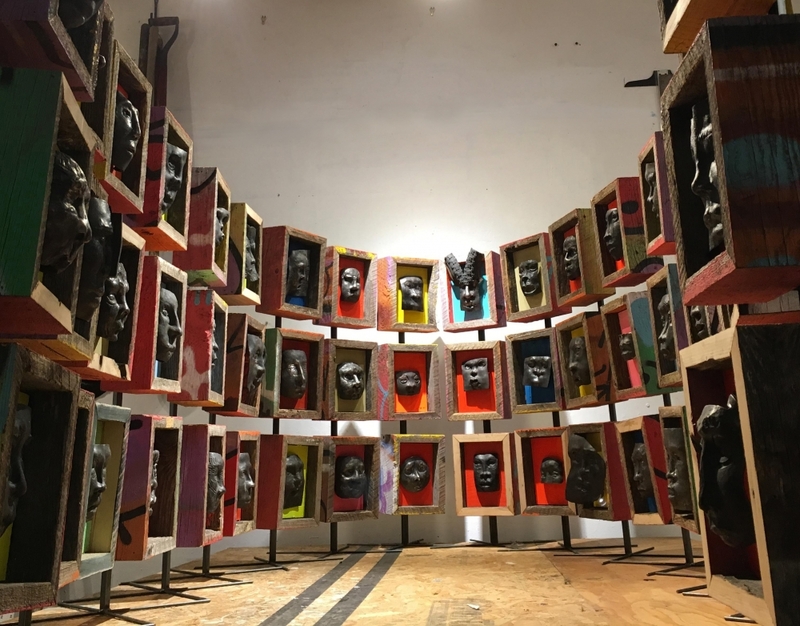 This past weekend, San Francisco-based gallery Jenkins Johnson—known for showcasing work by contemporary artists pushing boundaries of gender and race—launched a project space in Brooklyn’s small but historic Prospect Lefferts Gardens neighborhood. Located just south of the Brooklyn Museum, it’s one of the first spaces of its kind in this small but historic neighborhood. To christen the new space, owner Karen Jenkins-Johnson brought in Brooklyn-based artist Derrick Adams to guest curate not one but two inaugural shows. Adams’s collages, videos, paintings, and performances are often filled with black characters that riff on pop culture figures from 1980s and ’90s advertisement and TV series, like In Living Color. This isn’t his first dip in the curatorial waters, either—he recently served as guest curator for the inaugural curated section of VOLTA NY 2016. Adams spoke with Observer about what it’s like to wear two hats and curate two shows at once. This isn’t the first time you’ve curated an exhibition. As an artist yourself, is it difficult to pare down a list of your peers when organizing a show? Whenever I curate something, my main goal is to include a lot of emerging artists. I think about works that I’ve come into contact with recently and over the years, artists I’ve met that have made me think about my work differently. You know, when I meet other artists, I tend to take a lot of notes. So I’ll start there, seeing what things stick out to me looking back over those. What additional curatorial perspective do you bring to the table as an artist? Well, I don’t see myself as a curator, firstly; I’m definitely an artist who has occasionally curated shows. But I think about what I want as an artist when I organize a show. Galleries have another way of understanding artists and what we need, but it’s different because they’re running a business. Of course that’s so important to an artist—you need to sell work and make money. But often artists want their work to be seen in certain contexts, or want certain ideas brought out in their work. So what I try to bring is that context; my main concern isn’t the commercial side of the show. I have a degree of removal from that as a guest curator. I like to create a kind of intense dialogue around a theme, like an issue that the general public can relate to. Putting together these shows for Jenkins Johnson really allowed me to challenge myself in that way, too, because their new gallery isn’t a traditional art space, it’s more of a domestic space. It offered me a new way to think of putting a show—or in this case, two shows—together. What did the domesticity of the space inspire for you? That intrigued me more as an artist than a curator, trying to figure out what makes sense in the space. It’s not an environment I worked in before. It’s more of a house, you know, and it’s very historic and has a lot of personality. Because of that, I thought the work should have more intimacy in it, because the experience of the space feels domestic. I’ve tried to make it so you can have quiet moments with the work. I wanted the work to look like it belonged there, like something lived-with. The space was really one of the deciding factors in taking on this opportunity—because it’s just so cool. Let’s talk about these two different shows. You decided to curate a solo presentation of the work of Arjan Zazueta on the second floor of the gallery, with a group show, Hidden in Plain Sight, on the first floor. Are there any parallels between the two, or are they very distinct from one another? I think both shows come back to mortality or vulnerability in some way. There’s a subversive language happening in a lot of Arjan’s formally beautiful works. He makes these elaborate, playful collages and paintings of floral arrangements that have small, more provocative, maybe even jarring, images inserted into them. He looked to Jan van Huysum, the 17th century Dutch artist known for these rich paintings of impossible floral combinations. I liked how he drew on this tradition of beauty but then created something that responds to contemporary political and identity issues, not to make them palatable, but to make them more visible. Hidden in Plain Sight, on the first floor, capitalizes on this theme of subversion in a different way. It features six diverse artists from all over the country, all of whom are looking at the contemporary urban environment and how it shapes our ideas of self. But they channel what they see through very different mediums: photography, painting and mixed media sculpture a group of artists all dealing with similar subject matter but in very different ways. Devin Morris, in his photography, makes his subjects androgynous. They’re cloaked in these monochromatic clothes against monochrome sets. The work is all about the body and how we understand gender and gender roles through the images of people that circulate in the media. That led me to think about the work of Carris Adams, whose riffs on beauty shop signs from neighborhoods around Chicago. And Kennedy Yanko’s works are like crushed metal structures but with textures of human skin—to me, it really spoke of not only the erosion of the body, but the material world at large. I was really surprised how the work of all six artists spoke to each other so well.